Tanning beds, schmanning beds. Who needs 'em? You look great no matter what! I designed this poster after seeing several videos online of people who are obsessed with tanning, particularly tanning beds. Sometimes being bombarded with facts and statistics as scary as they are, just don't seem to get through so I tried something a little different. 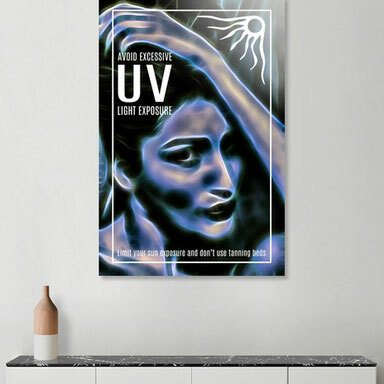 Rather then go for the usual "it can cause cancer and other health risks" (very true) approach to awareness advertising, I created unique light effects over a fashion magazine type pose with less emphasis on facts in an attempt to make not tanning "look" more appealing. I have it available in limited editions on my wall art shop! Check it out!